Sony Computer Entertainment and Media Molecule have released a Tearaway Unfolded fact sheet (below), which gives us an idea of what we can expect from the PlayStation 4 version of the game. Most notably, features of the DualShock 4 controller have been incorporated into the game, offering players a unique experience. Have a read and let us know what you think. Don’t forget to check out some beautiful screen shots at the bottom of the page as well! Use the power of wind to propel your messenger through the skies in their paper plane and explore the world from above. Shine the wireless controller’s light bar into the TV to illuminate dark and gloomy places, growing and transforming the scenery as you do, and guiding your companion along their way. Push and release the touch pad button to squash drum skins and spring your messenger up into the air or across platforms. immersive and unique gameplay experience. Platforming! – Above all else Tearaway Unfolded is a platform adventure game and Media Molecule have taken the experiences from making the award-winning LittleBigPlanet series and applied them to a vibrant, living 3D world. Paper Engine with Real World Physics – Tearaway Unfolded’s exclusive game engine creates a 3D animated world from sheets of paper to capture the real physics of paper material that will tear, fold, or crumple, especially when the player reaches out and interacts with the world. Story Time – Tearaway Unfolded is comprised of three short stories, which intertwine into one larger narrative, through which the player and their messenger friend are guided by two (mostly) wise and playful characters, the Green Man and the Fortune Teller, on their quest to hear new tales. 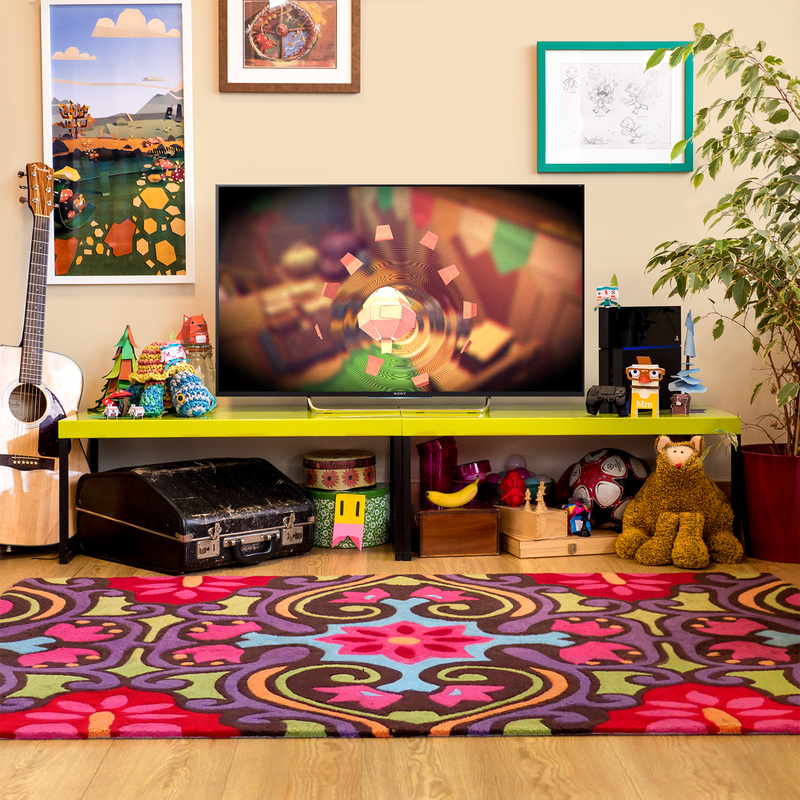 Two worlds collide – Tearaway Unfolded is a living papery world inside the player’s TV, and constantly breaks the fourth wall to deliver a unique game experience. Tearaway Unfolded is an experience like no other; a game that knows the player exists, and integrates them fully into the story. Print & Create Papercraft – As they play through the game, players will be rewarded with real papercraft plans of the creatures, objects and characters from the game to print out and construct, bringing the world of Tearaway to life in their own homes. There are over 60 models to collect, each with colored in and blank versions, giving players the opportunity to get really creative, and adding many hours of fun to the Tearaway experience! Share Favorite Gameplay Moments – Players are encouraged to share special gameplay moments via social networks, using your messenger’s in-game camera to take photos of their adventures, with collectable filters and lenses allowing them to add their own creative spin. Tearaway community site – Tearaway.me (http://tearaway.me) gives players access to their papercraft collection, and all the in-game photos they’ve shared, along with the photos taken by the rest of the Tearaway community, either from their own adventures, or of their papercraft models. Unique Experience for Every Player – From unlocking the unique message inside their messenger’s head, to decorating things along their journey and customizing how their messenger appears inside the game, Tearaway delivers a truly personalized gameplay experience.